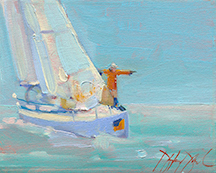 Class will cover the basic principles of oil painting with regard to painting boats. 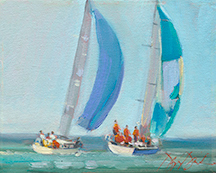 After the basics are covered, we will start by painting some basic boats and move up to more complicated sailboats throughout the next couple of days. For those who have studied with Douglas before, this overview of principles is always a good review, and no matter what the subject, these principles are key, and new discussions and tips are added each season. Each day’s demo will include simple discussions on composition, massing, building form, light and shadow, near and far, capturing and developing atmospheric distance, and depending on your own style, knowing when a work is finished (learning how to not overwork your painting). Students will work in their own style/technique so that the finished work is their own. Douglas will overview his palette and concepts his work entails. Students will mix paints and learn to mix basic strings of color to help comprehend the preparation/set up to prepare to paint out-of-doors and in the studio. 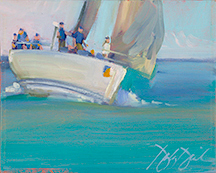 Students will work on small canvases, and the emphasis will be on capturing the time of day, atmosphere and the gesture of the boat, whether large or small, in a quick concise way based on the covered principles. Depending on the skill level of each student, students are able to grow and develop at a rate that is to their comfort. Demos and individual discussions/instruction will help each student begin to reach the preliminary goals they are striving to meet. Plan to produce several studies and at least one or two larger paintings. Douglas will provide photos to paint from and will include at least one session painting by the nearby marina en plein air (out of doors). Plan to bring notebook/sketchbook and enjoy some demos, along with some great stories to help you remember these principles that are the foundation of Douglas’ teaching. Douglas has a “suitcase of supplies” he brings along, it includes some recommended books, and some supplies in case a few students need a few items that are forgotten. Douglas also will offer a “BASIC PAINT KIT” (while supplies last) which includes all the basic oils, brushes, palette knife, palette and canvas panels and medium for those who do not want to buy these supplies individually. You would need to bring some paper towels and rubber gloves. Douglas also will have a few French easels available while supplies last. Call the venue for pricing of this kit. Oliver Art Center will provide a classroom for the duration of the class, but be prepared to go out of doors once or twice en plein air. The beauty of this class will be painting boats from photos and also painting boats in dock in the marina to really grasp the shape and structure of these vessels. Late Afternoon: Walk down to marina to paint a quick boat in dock. 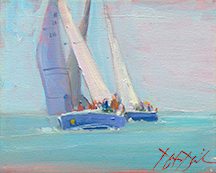 *If Oliver can arrange it, we will have a “tour” of a sailboat at end of first day and talk to the captain about rigging and various items of interest in sailing as we wind down our first day of painting boats. 1st hour: Coffee at Oliver/Review and discuss individual challenges. Lunch: Best to brown bag (Crescent Bakery, Subway, Frankfort Deli) on these workshop days and to break as a group and kind of picnic somewhere on way to the marina. 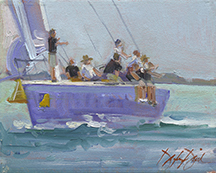 Afternoon: On Location - Paint boats in Marina near Oliver Art Center (Demo on making study into larger painting). *If Oliver can arrange it we might have a visit during our coffee in the morning from someone from the neighboring Coast Guard to briefly discuss boating and their part in the community and on the history of the boathouse, Oliver Art Center now calls home. Lunch: Brown Bag (Crescent Bakery, Subway, Frankfort Deli). Afternoon: Finish boat paintings, have small show of work accomplished and review specific problems.